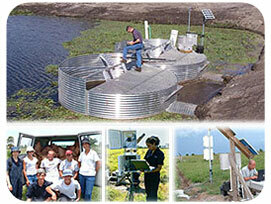 Southern DataStream (SDS) is a consulting office based in LaBelle, a rural south Florida community in Hendry County. The technical focus of SDS is hydrologic science and engineering services, provided to government agencies and private land owners. In parallel with delivery of technical services, SDS works to support international development through human resource training, develop and fabricate new hydrological measurement equipment, assist local K-12 education through lectures and mentorship and participate in governance and public advocacy groups towards improvements of climate change policies, regional land usage and water management. What makes our organization unique is the general approach we use. While SDS is engineering consultancy company, it is not just another traditional firm - the concept is to operate like a independent university research program, with a primary scientist, few technical support staff members and larger number of local and foreign trainees, who are pursuing theirs internships in the training program that SDS (with its partners) has been pursuing since 1999. Unlike in a traditional business group, our personnel are not burdened with many administrative limitations and obligations, therefore most of the efforts are invested in real research and intensive training of new interns and assistants. Learn more about main conducted projects, study details of offered training programs and feel free to contact us. © Copyright 2006, Southern DataStream, Inc.